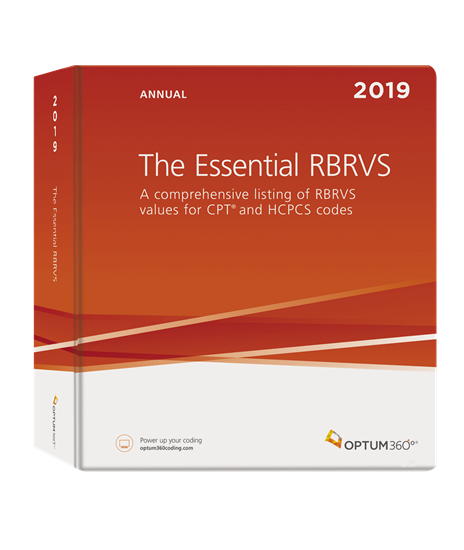 The Essential RBRVS gives you all the codes valued by CMS, as well as relative values for many codes not valued for Medicare.The RBRVS for the Medicare Physician Fee Schedule (MPFS)is used to set physician fees by Medicare and many commercial payers. However, the RBRVS does not provide a complete schedule. Codes not valued for Medicare are referred to as “gap” codes. The Essential RBRVS provides Medicare values and “gap” values to enable you to develop a more complete fee schedule. Optum360 Edge—Gap values for complete fee schedule development. Relative values for many codes not valued by CMS for the Medicare Physician Fee Schedule. Includes the same data relied on by over 70 percent of commercial payers. Negotiate stronger managed care contracts. Medicare payment indicators included. Global days, multiple procedure reduction, assistant surgery, pre-op, intra-op and post-op percentages, OPPS cap, and other indicators commonly used for Medicare and commercial claims. Organized by CPT® and HCPCS codes. Consistently value services and procedures from different code sets. Total values and components for each code—including work, malpractice, practice expense, and total RVUs. Evaluate the cost and productivity associated with a service, providing a more complete picture of your reimbursement.